How to make No Onion Garlic Curry/Daal Recipes | No Onion Garlic Curry/Daal Recipes can be as tasty and delicious without onion garlic too. You don't have to compromise on taste or texture if you use the right ingredients. There are plenty of other ingredients which you can use to make dishes flavourful and even you won't notice the lack of onion and garlic. Usually, 90 % of Indian cooking is dominated by these very two root ingredients onion and garlic. These are synonymous with Indian cooking. No doubt that these two ingredients land so much flavour, texture and taste to Indian dishes. 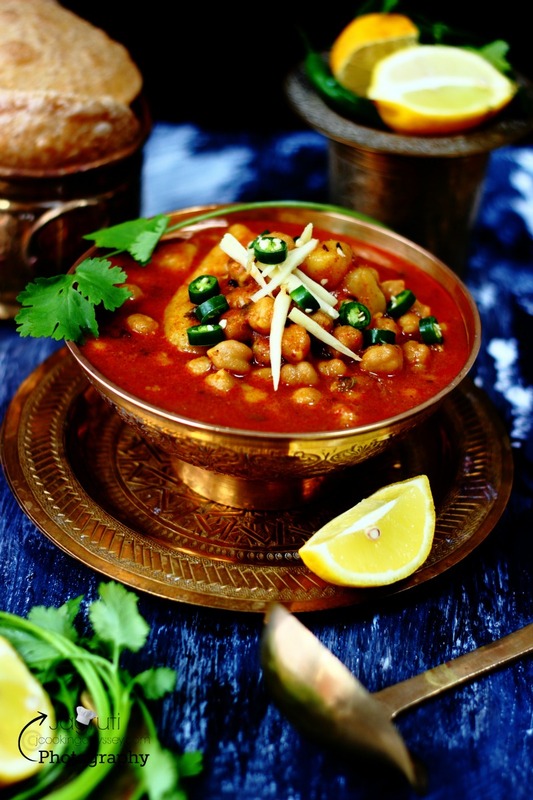 Many Punjabi and Mughlai curries are not even imagined to cook without it. Although these two ingredients are packed with nutrition, in many Indian households and places such as temples don't like to use in their cooking. Many who likes to use most of the time, still they avoid onion and garlic during a fasting period such as Navratri, Shravan Month ( Holy month of Hindu religion) or Adhik Maas. (an extra month appears every few years) in Hindu calendar. Or simply sometimes you feel like having a simple and light meal without onion and garlic. We love onion and garlic in our food, but there are times when we don't feel like incorporating in our cooking, especially if there are weekday breakfasts. Luckily, you can prepare Indian dishes without onion and garlic and make delicious and tasty too. Here I have 12 absolutely delicious and easy to prepare No onion Garlic recipes for you try out this fasting season. 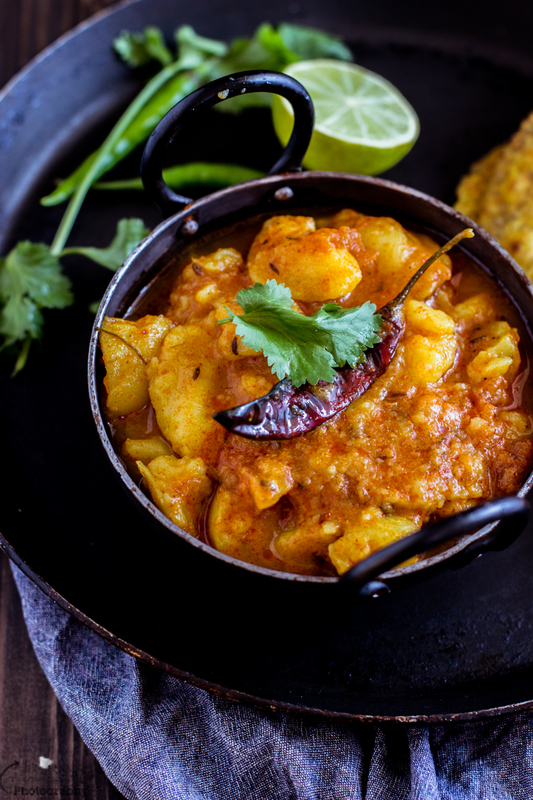 If your taste buds are craving for an Indian curry, try this Aloo Matar without Onion Garlic, it will be a definite addition to your recipe file. 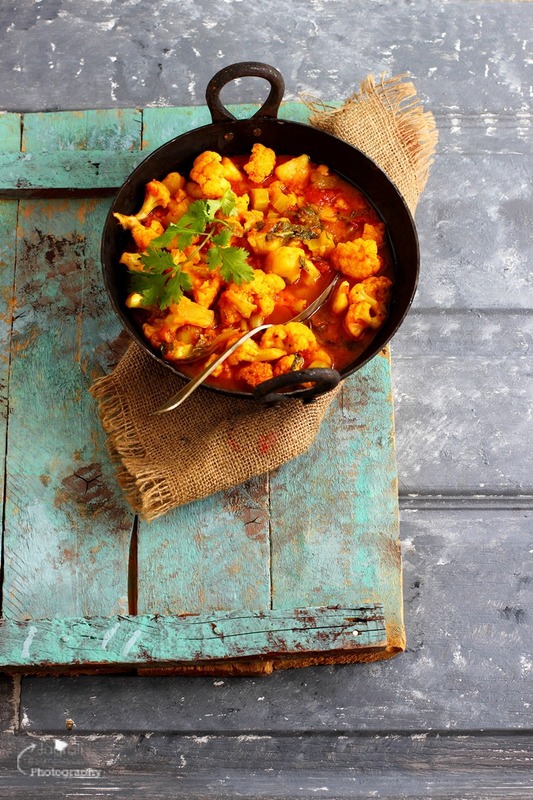 This classic, delightful and effortless Indian dish is too good to be missed. 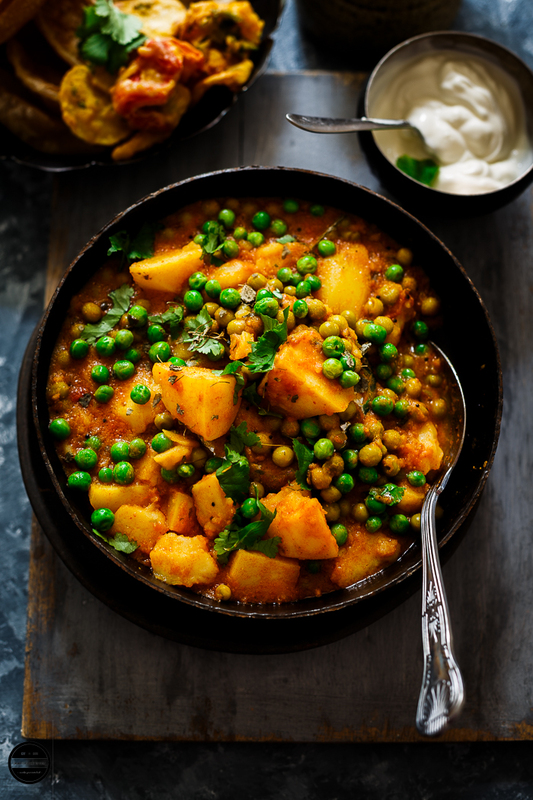 In this finger-licking curry, potatoes and green peas are cooked in tomato gravy with basic spices. Although in this recipe no onion and garlic have been used, the curry is still full of flavour. Aloo Matar is pretty easy to rustle up whether you use onion garlic or not. A crowd-pleaser curry which can be prepared when you are restricted to not use onion and garlic on religious occasions. is a simple and saatvik (Pure without Onion & Garlic ) curry. A very easy to follow recipe yet delicious and soul satisfying dish which can be paired with roti, puri or paratha or even naan as there is a plenty of finger licking gravy to dip in. Once in a while you will not miss, typical North Indian Chole when you will try this Aloo Chole, without onion and garlic. 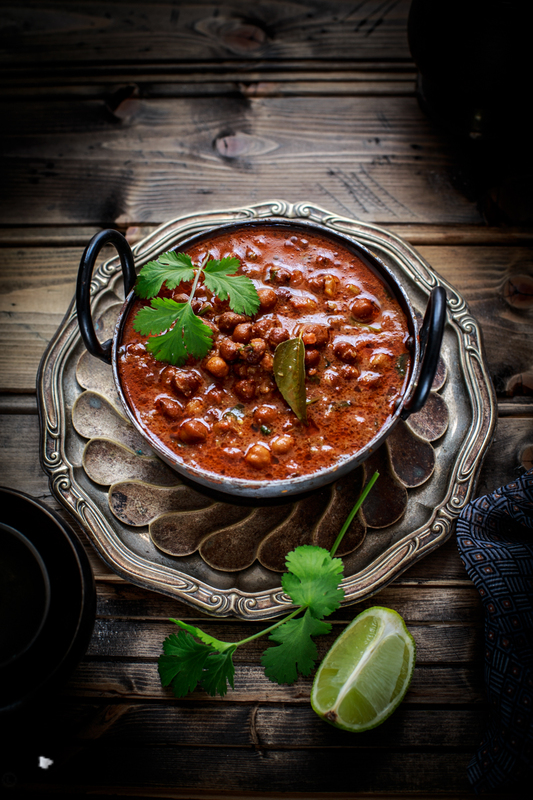 This curry is full on with all flavours and still tastes almost like a Punjabi Chole Masala, surely medley of flavours will be dancing on your tongue with every bite. Veg Paneer Makkhanwala without Onion and Garlic is as delicious and delectable as Veg Paneer Makkhanwala with onion and garlic. This rich, creamy and buttery dish can be prepared with medley of vegetables or paneer which is a popular choice for vegetarians in restaurants or any other occasions for the mains. So easy to whip up yet it has this unique taste. 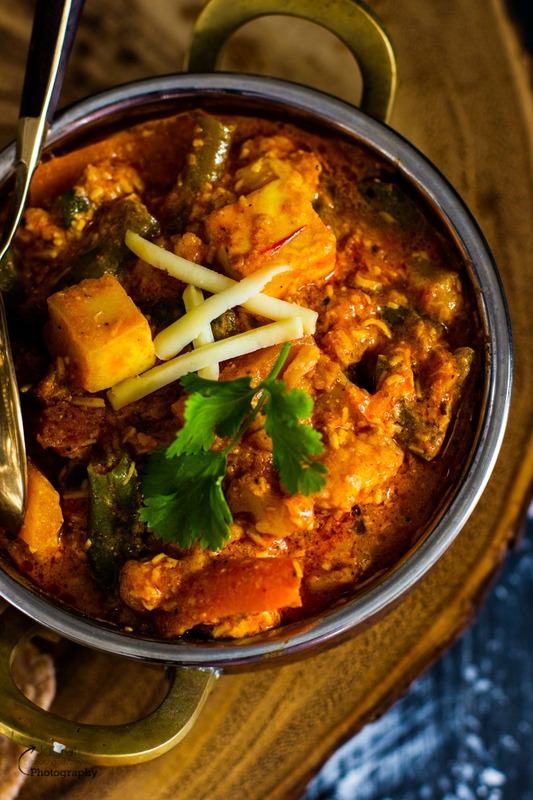 Spicy, Sweet and Tangy flavours that are in this curry makes it Phenomenal. 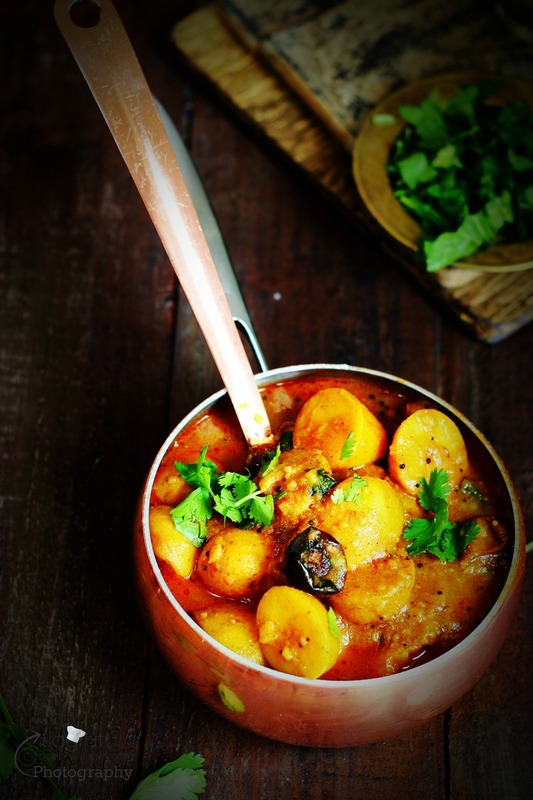 Aloo Tamatar Ki Sabji is that one of the easiest Indian dishes you can prepare. It is very simple yet versatile and irresistible sabji can be done in jiffy or jiffy where Aaloo (Potato) and Tamatar ( tomato) cooked with basic Indian spices. 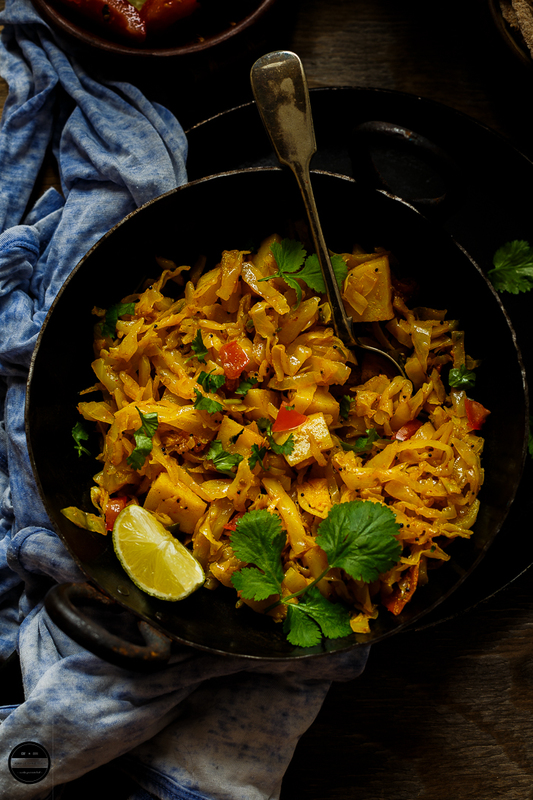 This quick and easy but colourful Cabbage and Potato Sabji (Kobi Bateta nu Saak) is delicious with mild flavours which can be prepared in less time. All the deliciousness of it in simplicity. An everyday stir-fry style sabji is great for lunch boxes as it is dry and goes well with roti or phulka. Rasadar Kala Chana Nu Saak is a classic curry recipe of Gujrat, which is cooked in mildly sweet, tangy and spicy tomato and tamarind gravy and made without onion and garlic. Rasadar Kala Chana is protein packed, nutritious and vegan. 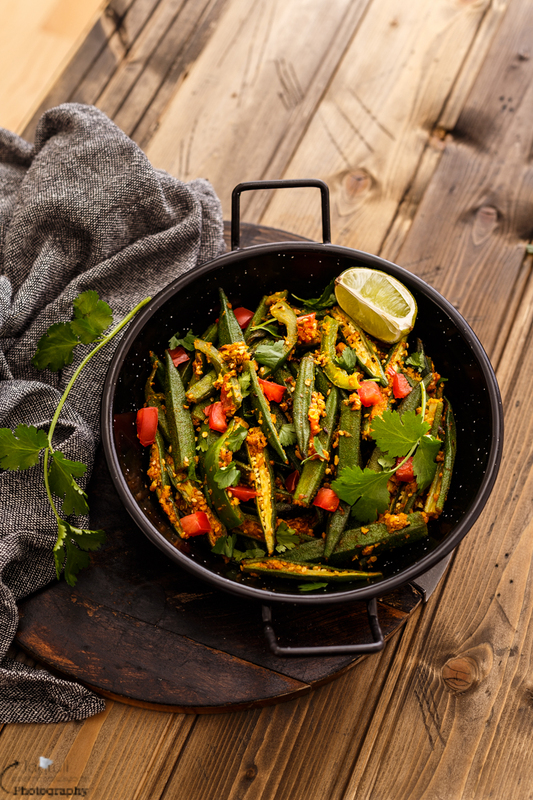 This lip-smacking and flavourful curry is vegan and gluten free, is simple to prepare and can be served up in no time. This curry is best served with roti, Gujarati kadhi and rice. Farali Bhinda Capsicum is easy to prepare, flavourful and a delicious sabji without onion and garlic, thus it can be eaten while you keep fast. Fresh and tender Bhinda cooked in aromatic Gujrati Masala with capsicum and tomatoes and garnished with roasted peanuts and fresh coriander leaves for extra flavour and crunch. 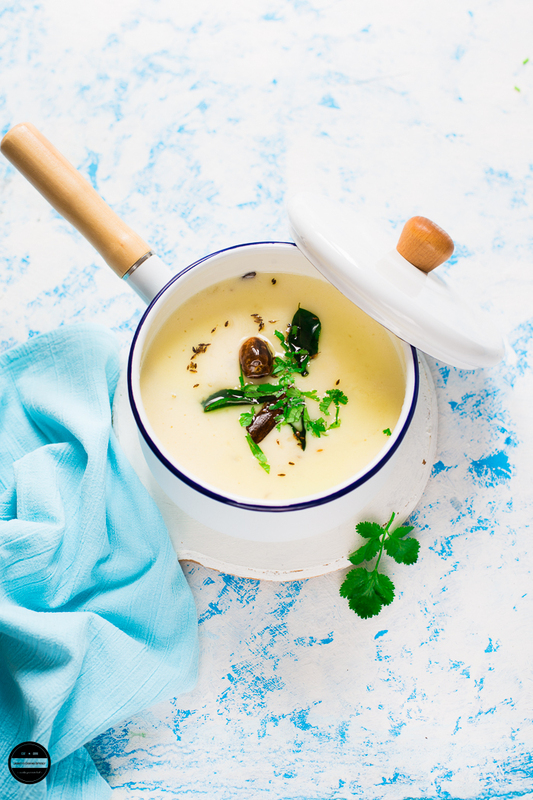 Gujarati Kadhi, is a yogurt based creamy soup. Gujarati Kadhi is thinner than Punjabi kadhi, mildly spiced, sweet-sourness that is typical of Gujarati cooking. This kadhi is great to eat with plain rice or khichdi. 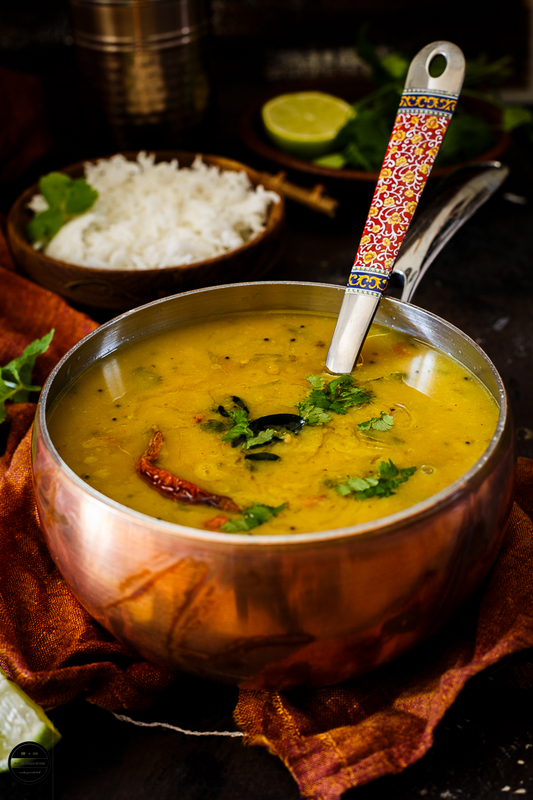 A homely, delicious and easy daal recipe for you to enjoy with any sabji, roti and rice. 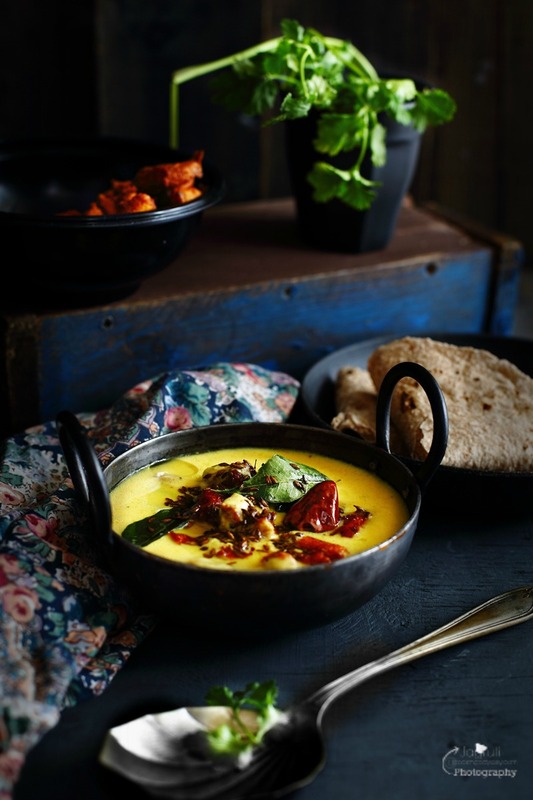 This tantalising and simply irresistible Fulwadi Ni Kadhi is so easy to prepare. Thick, spicy and slightly sour, gluten free yogurt soup prepared with yogurt, chick pea flour and delicious deep fried Fulwadi submerged in it, loaded with cumin, curry leaves and red chilll flavoured tadka ( tempering ) on top. Awesome collection of no onion garlic recipes. These made me nostalgic. Remember mom made no onion garlic satwik recipes Superb share. Wow. Awesome. All No onion and garlic recipes are at one place. I'm bookmarking this. I usually think, how to attain that taste in curry without onion and garlic. I'm sure your recipes will help me. Thanks for sharing. An awesome collection of no onion no garlic recipes. What I like about Gujarati food is that most dishes do not have onion, many have garlic. Jagruti, So handy to have these recipes for saatvik food days! Your photos are a visual treat as well. Great collection of recipes and honestly, I dont miss the onion and garlic flavours when we have so many great options. Being a south Indian, we observe Sattvick cooking for few days a week and it has great health benefits too. Great share and fab photography as always. I completely agree! Curries can be delicious without onion and garlic. Most curries from Kashmiri pandit cuisine (even non veg) are made without onions and garlic and they turn out amazing. Your curry looks luscious and robust. Couldn't take my eyes off the clicks. I am drooling over the gorgeous pics Jagruti ! 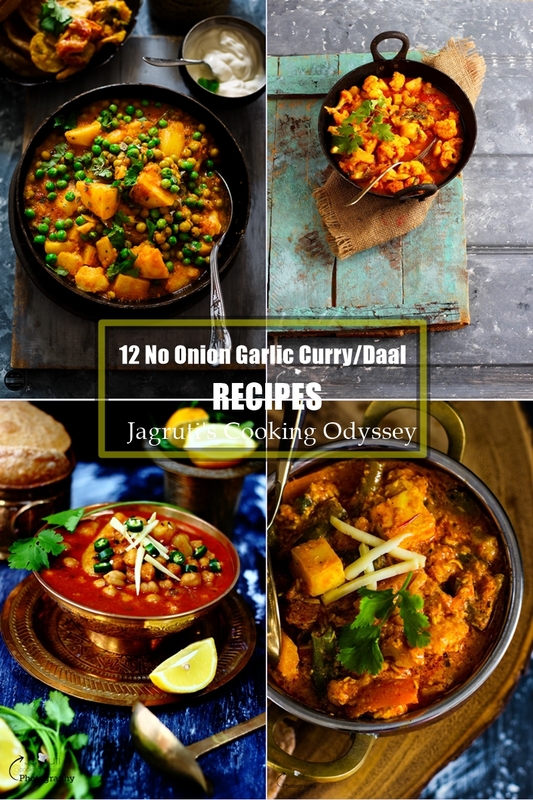 Awesome collection of onion garlic free recipes..perfect treat to open a fast. wow amazing collection of no onion no garlic recipes. Where I everyday use them find hard when both of them get over. Perfectly cooked and awesome. Lovely collection of no onion garlic recipes here. Shall comeback again to refer. I love the simplicity yet divine taste of no onion garlic curries. They all look absolutely inviting Jagruti. Such a wonderful compilation of no onion and no garlic recipes. Your clicks make it more tempting.Fab share Jagruti.